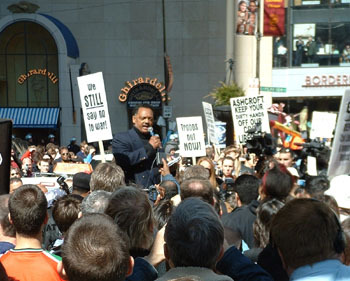 I, for one, was proud to march with Jesse Jackson through downtown Chicago at the March 20 protest. I was literally about five feet from him through most of the march to Federal Plaza. It will remain a moment in my life that I will remember with pride. I find all the trash talk about Jesse that is being posted here racist and disgusting. How can you expect to reach a broader audience with your message if your message isolates important people who were fighting for human rights probably before you were even born? There are too many Republicans running around posing as peace activists saying maliscious things in order to make the anti-war movement look bad. Some people go so far to the left that they go full circle and find themselves at the right. And furthermore. Face it. If you wanted to complain about or do something about the march being re-routed, the time to do it was about 12 noon on March 20! Blaming the Democrats now is stupid and defeatist. It was a wonderful march! Why cast a dark cloud over it by whining and moaning after the fact?